A cordial welcome to all of you, who in various capacities are bound to the Institute for the promotion of the new publicist generations. I thank the Directors Bernhard Remmers and Fra Helmut Rakowski O.F.M.Cap. for their words of greeting. 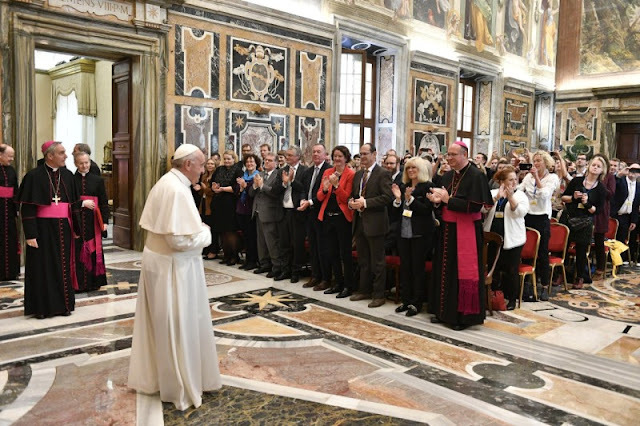 Fifty years ago, following the Second Vatican Council, the journalistic school of the Catholic Church in Germany was founded, with the intent of taking charge of the people who work in the media. Since then your Institute has trained qualified journalists who work as Christians in society. Here I would like to express our heartfelt thanks to all the managers, students, alumni, friends and supporters for this commitment. Germany can be considered lucky by knowing that there are many graduates of the institute among the many journalists, that is, both in the secular and in the ecclesial media. Which Christian journalists distinguish you for your positive attitude towards the person and your professional ethics. You do not just do a job, but fulfill a task and a commitment. How easy it is, however, to be carried away by a common opinion, by a defeatism by a pessimism that paralyzes and blinds! "By habit we no longer face evil and allow things to" go as they go ", or as some have decided they should go" (Apostolic Exhortation Gaudete et exsultate, 137). We ask for parresia, we ask for the frankness that comes from the Holy Spirit and that helps us to trust in the truth of Christ that makes us free. We go beyond the wall of sadness and resignation and help people to open their eyes and ears and above all their hearts to be custodians of each other and to realize that they are sons and daughters of the only Father. Thank you because as journalists you look at people and call injustice what is injustice. Thank you because you also talk about beautiful things that perhaps end up less on the front page, but that put people at the center. Thank you because with your Christian style you accompany the work of the Church. I wish you continued to make a journalism of people and people. And please do not forget to pray for me. Thank you.